Homepage of performance artist Miss Minetti. Miss Minetti, ‘Queen of the street’ is a high powered executive with a novel business plan. She has decided open her corporate headquarters in the centre of town! Her operating budget is very small and office rental prices are just too high so she has decided to set up her office on a small street corner and recruit employees from the crowd that passes by. In order to find the right associate, Miss Minetti selects an unsuspecting member of the public at random and then subjects them to a series of training exercises designed to bring out their more aggressive business instincts. 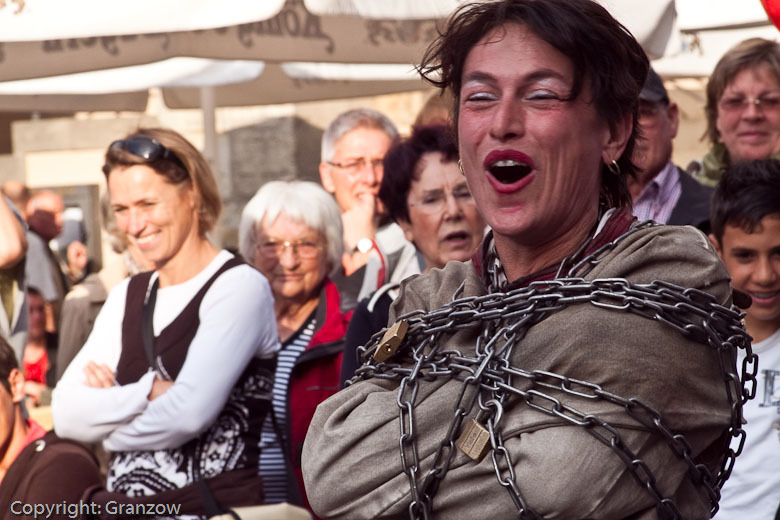 In a whirlwind “motivational seminar”, Miss Minetti collates her own special brand of interactive comedy and improvisation with classic motivational techniques such as the walk of death, fire eating and the extra special “how to escape from a straight jacket” for corrupt executives who might be “ON THE RUN”. Available as a 45 minute concert or as individual segments of 5 to 10 minutes, Miss Minetti is also an excellent compere, master of ceremonies or CEO.